They do nothing for me… Nothin’. Give me a good cast iron skillet and a wooden spoon and I’ll be one happy gal. Lately, I’ve been hunting antique stores when I’m in need of new kitchen tools. Potato mashers with worn wooden handles, tarnished silver serving spoons, vintage carbon steel knives with lots of patina, and bowls with chippy edges bring a bit of extra warmth to my homestead kitchen. They seem to carry a special energy with them, and as I stir, and mix, and mash, I can’t help but wonder who gripped the handles before I did and what sort of families they fed. Back in my ultra-frugal newlywed days, I was all about the cheapest kitchen tools I could find. But not anymore. These days, I’d rather invest in high-quality tools that last, not Made in China non-stick pans that scratch and warp after a few uses and plastic spoons that snap under a load. I’m not a fan of our culture’s throwaway mentality so I’m happy to pay more for quality items that will last a lifetime. My kitchen holds my cherished wooden spoons from Old World Kitchen, a stack of wooden cutting boards I’ve grabbed on sale here and there, chipped enamel bowls from the antique stores, and my battle-worn cast iron skillets hanging proudly on the wall, just to name a few. Tools like cast iron, stoneware, copper, and wood get better with age. Heritage-style tools generally require minimal care, and with just a bit of consideration, they can be enjoyed by generations and avoid the landfill like their cheap-o counterparts. And hey– here’s a fun fact: although I’ve used wooden cutting boards for years, I always assumed they were less safe than plastic boards. However, I recently stumbled across a research study at UC Davis confirming the exact opposite. The study showed that plastic boards tend to hold onto bacteria more stubbornly than their wooden counterparts, especially once they become scarred with knife cuts. Safe to say, I feel incredibly validated in my wooden cutting board choice. Take that, plastic. 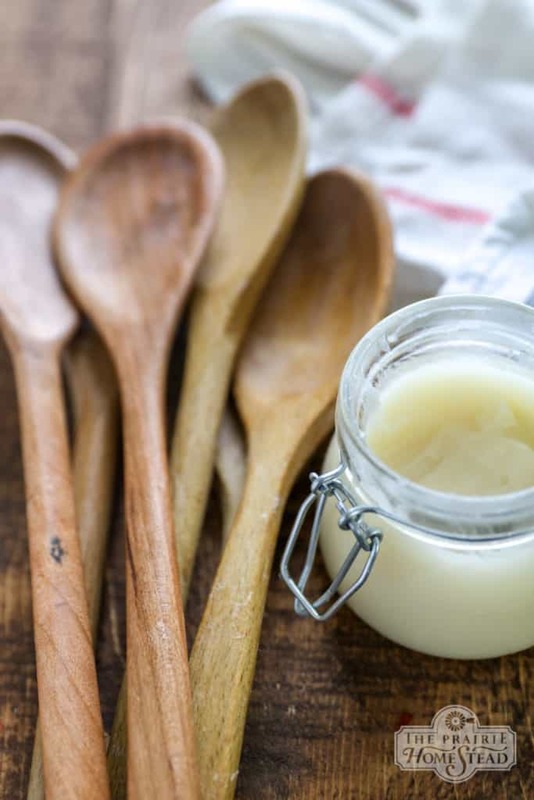 Anyway, wooden kitchen tools don’t require much TLC, but they do appreciate a bit of moisturizing every now and then in the form of oil or spoon butter. 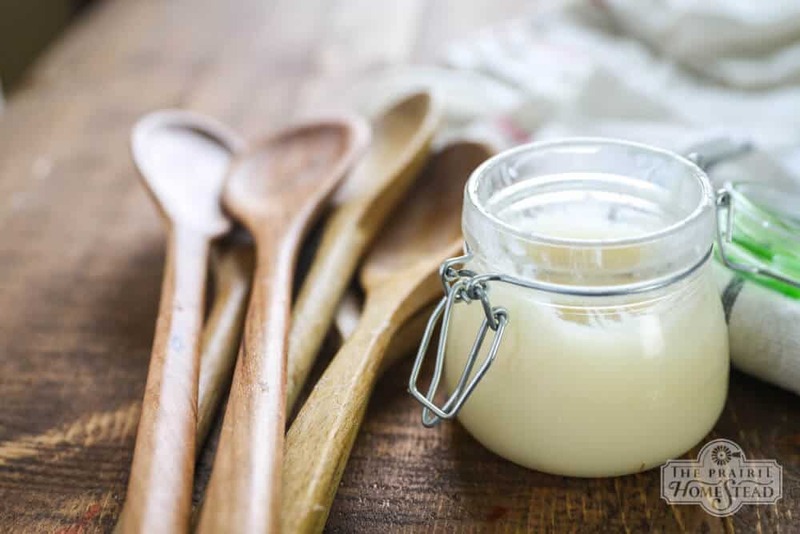 Spoon or wood butter (also known as cutting board cream) is simply a mixture of oil and beeswax. 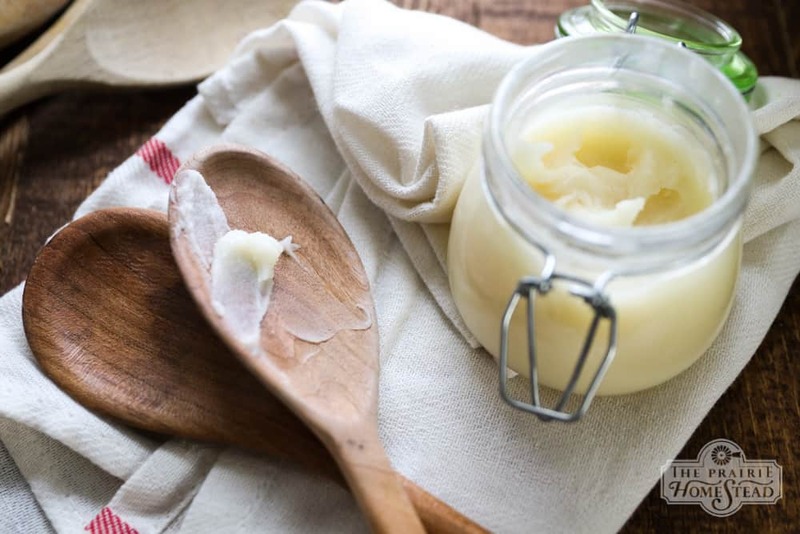 It’s not something you eat, but rather use to moisturize and protect your wooden boards, spoons, and handles. (Have you noticed anything butter-related is always a good thing? 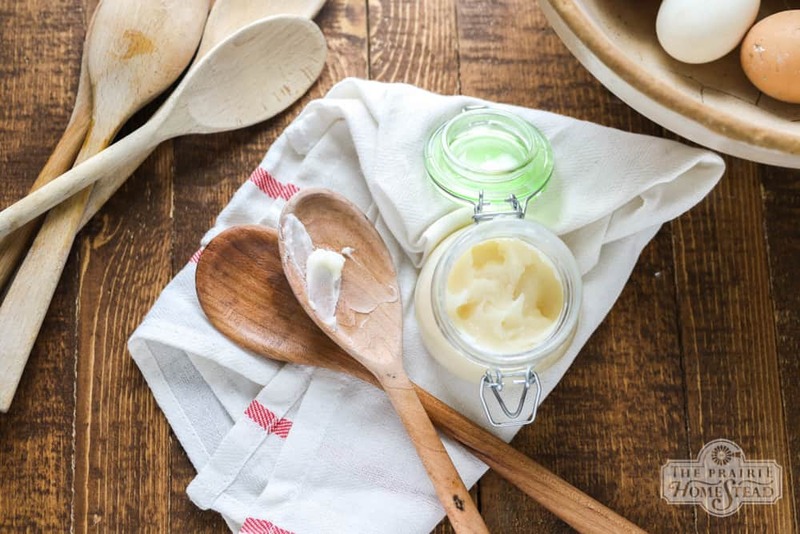 There’s sweet cream butter, and whipped body butter, and now spoon butter… Hmmm…) Applying wood butter or cream to your kitchen untensils will prolong their lifespan and prevent cracking and splitting. I’m a fan of the little beeswax pellets or pastilles for many of my DIY recipes (they melt more quickly), but you can use chopped beeswax if that’s all you have. The measurements don’t have to be super-exact. Get unrefined coconut oil here. 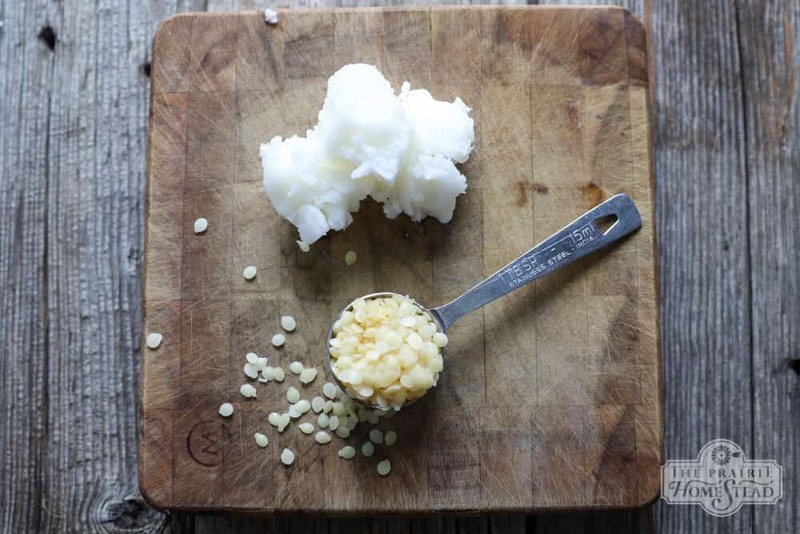 Place the beeswax and coconut in a small glass jar and place the jar in a small saucepan filled 1/3 of the way with water. Set on a burner over medium-low heat and stir occasionally until the beeswax is completely melted. Let the mixture cool, then apply a generous layer to your wooden spoons, cutting boards, and any utensils with unpainted wooden handles. Rub the spoon butter into the wood and let it sit for several hours or overnight to give it a chance to soak in. 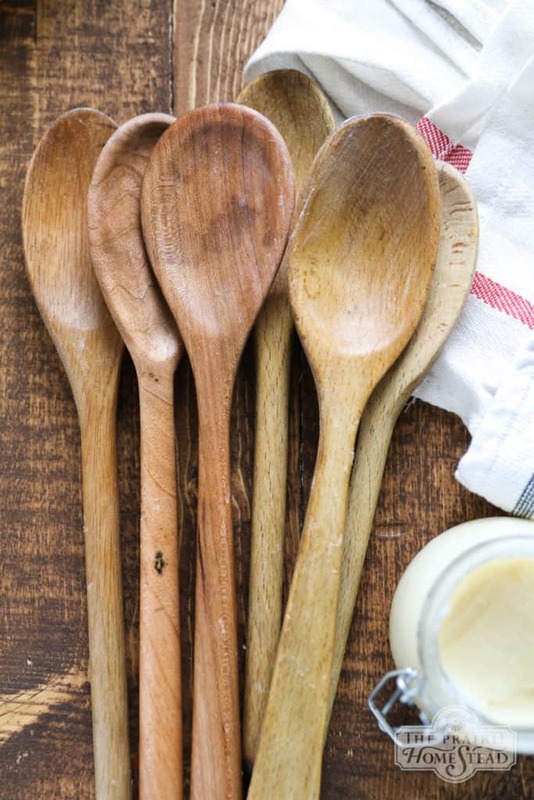 Repeat the process whenever your wooden spoons, utensils, or boards are looking dull and dry. 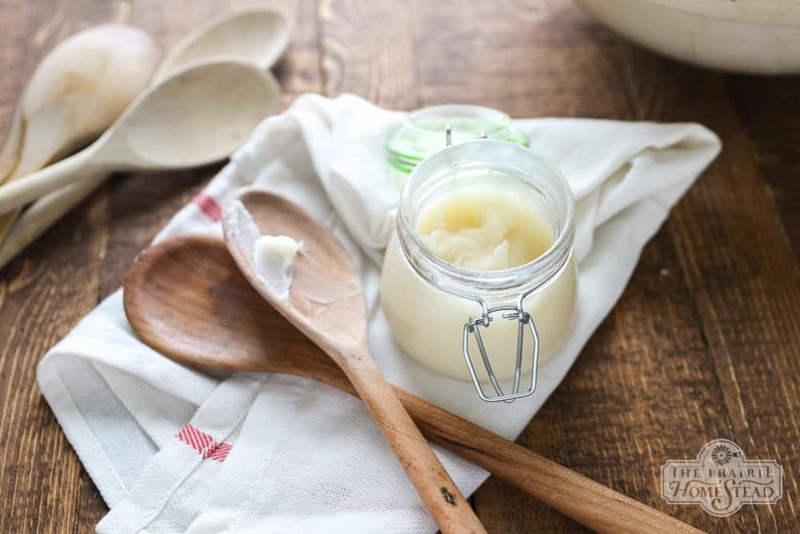 Your homemade spoon butter should keep for at least 4 months, if you don’t use it all before then! Thank you so much for this recipe! I have wooden utensils and cutting boards in need of treatment and didn’t want to use mineral oil. Whoops! Thanks for the heads up! Thank you for this post. I, too, love kitchen items that stand the test of time. My cast iron cookware is one of my most beloved possessions. My adult son took some pieces when he set up housekeeping and has continued to add to his collection. Lodge is wonderful and everything cast iron should be. But give me an old, well seasoned piece of Griswold or other cast iron of the bygone era any day. 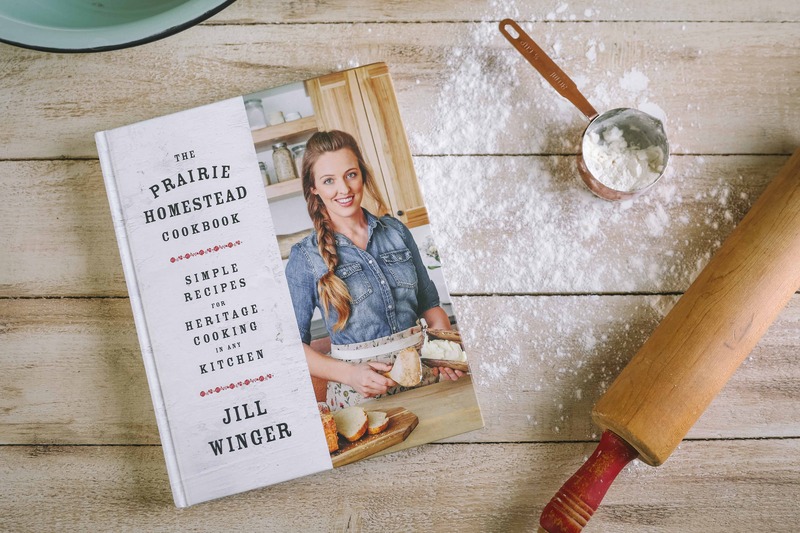 There’s something sacred about continuing in my kitchen the cooking traditions that began in another generation. I bought a wooden cutting board by Chicago Cutlery about 6 years ago. It was on sale because it had a fairly shallow split on the surface. But the cutting board size was right and I had to have something affordable STAT, so my minimum requirements were met. Still, I was concerned about that split harboring bacteria. It couldn’t be buffed out without damaging the board because of the size of the split. Someone wrote a blog post around that time about using coconut oil to season wooden kitchen tools. 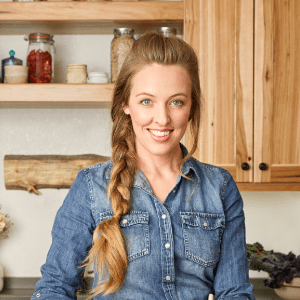 They extolled the virtues of coconut oil’s antibacterial, antimicrobial benefits and made the point that wooden kitchenware can be easily sanitized with coconut oil! After all these years the board has a beautiful weathered-but-cared-for look. I only use the wooden one for meats and have a corian marble one for veggies. Thanks for evoking happy memories of great meals lovingly prepared on reliable kitchen ware. Food just tastes better that way! Hi there. Loved the post and recipe. The pictures show quite a bit of butter on the utensils; do you rub it all in after the set time? Rinse? Would this work for conditioning iron skillets? I currently just rub coconut oil into the pans and heat a bit if the pan isn’t hot enough. I’m not sure you’d need the beeswax with cast iron– I’d just use coconut oil, etc, and bake it in. Wow!! I never even thought about something like this. I will be whipping up some of this stat! I love my wooden spoons (don’t get me started talking about my love for cast iron. . it makes my husband jealous! ;)) but hate how they get so worn and sad looking after awhile. Now, I know just what they need: a little tlc and spoon butter. Thank you! NOW I have a water in my mouth loved this recipe this looks so tasty I will definitely try this one next week in my weekend holiday.Love this one Thanks for sharing hope to see more from you. I would think a butcher block counter top will benefit from an application wood butter. My husband and I have a few beehives. Could I use the fresh beeswax from our hives instead of the pellets? 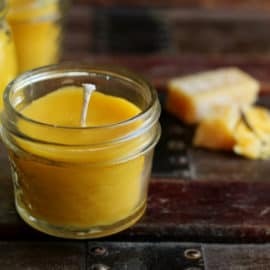 After filtering your beeswax it would be perfect for this project. You can’t get any better than home-grown beeswax. i tried my own spoon butter and looks really great recipe, thanks for your effort and very thanks for your share ? What a great way to preserve the wood for your kitchen utensils! Thank you so much for sharing! So nice to hear someone else echo my sentiments!! Love everything about your article including the recipe! LOVE LOVE LOVE cast iron, good ole stainless steel and cooking stones! Wooden instruments my favorite and ooooh golly to copper and patena colored copper! I have tons and will NEVER give them up! Country chick to the core! Thanks Jill! 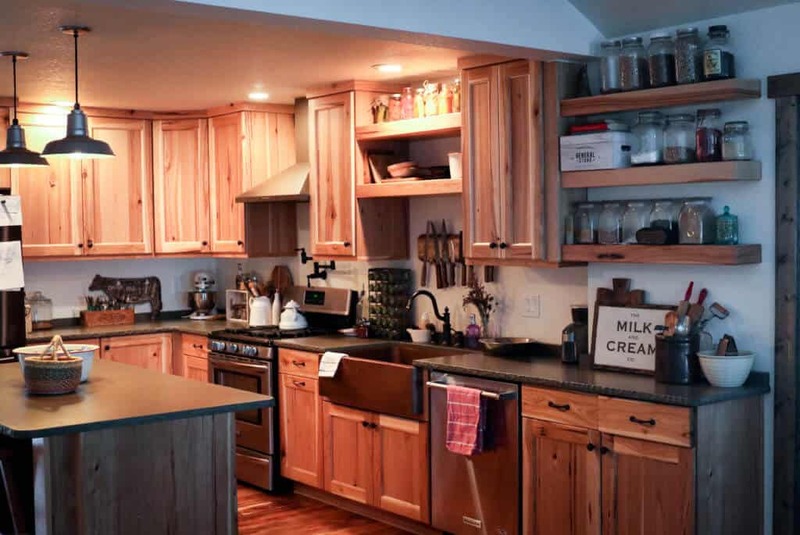 Wonder how this would work on wooden countertops, my kitchen counters are reclaimed wood…..any feedback or ideas? I imagine it’d work well for that! 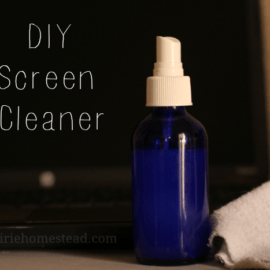 I use this on my butcher block counter top once a month and it works great. I also use on all my antique wood furniture. I have been making this “wood butter” for years, but always knew it as “wood wax”. I do add lemon essential oil to mine, but that is just a personal preference. The lemon does not affect the taste of food at all. Hi, I was wondering if you could use this on furniture and if so, could you then scent it with essential oils? I’m not sure– I think it might work, although it would depend on the piece, the type of wood, and the finish. 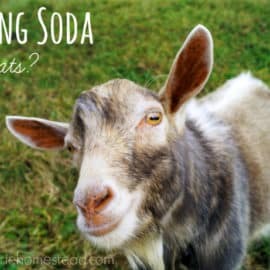 Could you add lemon essential oil in a small amount, or would that be unnecessary and potentially flavor the food you cook? Yes, you can add the lemon essential oil and it will not affect the taste of your cooking. I have always added the lemon essential oil because I also use it on my antique wood furniture as a “wood polish/wax”. Can you use this on furniture? Hmmm… possibly? I haven’t tried it, though. I rubbed spoon butter into my 90 year old oak dining room table- it works beautifully, the wood still feels and looks healthy and hydrated even several months later. I had used Howard Feed-N-Wax Wood Polisher and Conditioner for years, but was always disappointed how quickly my table top went back to looking thirsty and dull. So glad to have found such an easy and better solution. I also tried the spoon butter on our leather furniture that had gotten dried out looking- it works nicely, but use it sparingly and buff it out so its all absorbed. Yes, I use on all my antique wood furniture, but I add lemon essential oil to my recipe that I have been making for years. 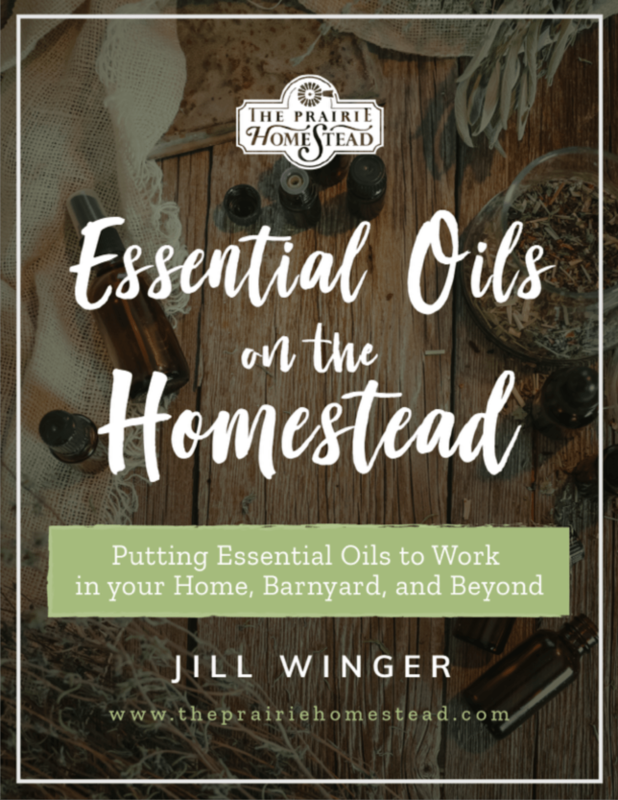 You really don’t have to use the essential oil, I just do because I love the smell of it. Dose it have to be unrefined coconut oil? could you possibly put a weight amount as well for the bees wax? I have a big block I’m trying to use up before I switch to the Pellets. I used a shredder to make it into a usable size. Marie, did you ever get a weight for the bees wax – I only have blocks of it too. 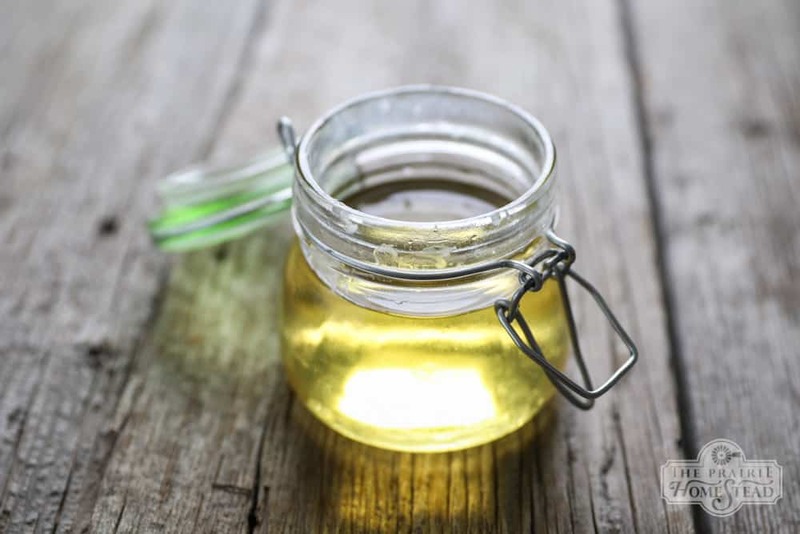 An old saying regarding applying oil to your wood goes like this… Once a day for a week, once a week for a month, once a month for a year, once a year for life. There is life in that wooden spoon or board that plastic cannot give…and it show in your cooking. I was wondering if this would help to prevent staining on a cutting board, eg. when you slice purple cabbage? I agree with your sentiments towards antique kitchen ware. I have a couple of old aluminum measuring spoon sets that I use all the time. My husband was given a set of cast iron pans & we LOVE them. I’d read somewhere that adding a citrus essential oil to a kitchen utensil butter works just fine, I think it was just a few drops per batch. 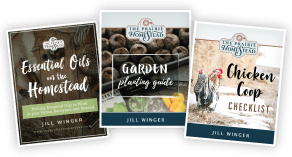 I always love reading your blog, thank you for another great post! Some are talking about their cast iron skillets, is this butter what you use on them? Or just straight coconut oil? Good to know. I have recently been collecting iron skillets and wooden spoons. Thanks for the recipe. Trying to get the plastic garbage out of my house. Love you blog. Have a great day. Loved the Spoon Butter recipe. Thanks. I love old crocks, cast iron and wooden spoons. I have a local man that is called The Spoon Man who makes beautiful spoons. I will have to tell him about that. He may already know. I have a question. After the spoons have soaked in the butter I guess you wash them like always. Can the butter be kept out or put in fridge? Why not just rub coconut oil into the spoon or board? What do you use do make your cast iron so eggs, or really anything, will not stick? If your stuff hasn’t been treated in a long time and/or gets heavy use I highly recommend sanding everything before you begin. 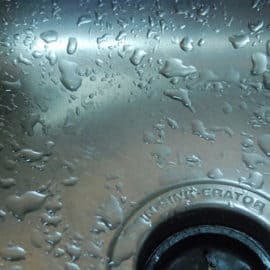 Utensils tend to get roughed up on the side from tapping them against the edge of a pot to remove food particles, and cutting boards can get nicks. Start with a rough sandpaper like 50 to take down the rough stuff, then go to 150 to even out the surface. Finish with 220 for a super smooth finish. Be gentle when starting out so you don’t take off too much; this is especially important for softer woods. 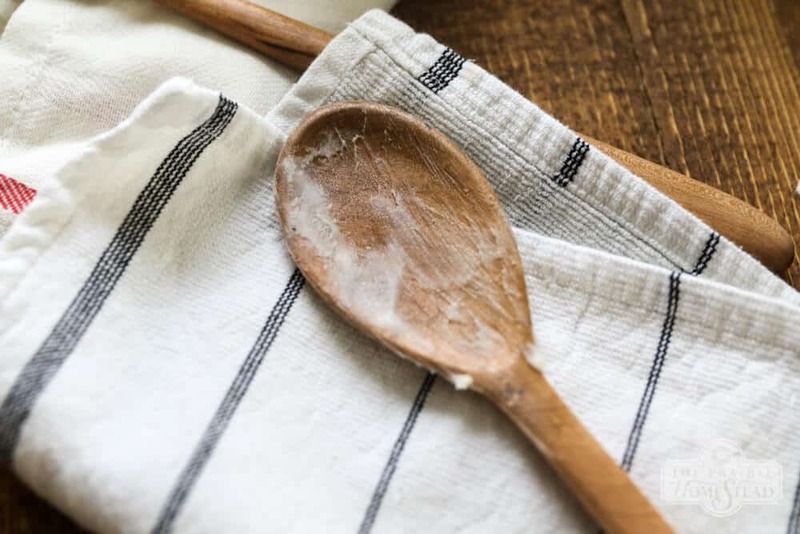 Once the sanding is done, wipe off the wood dust with a damp cloth then thoroughly wash and dry everything before applying the spoon butter. I hope this is helpful!